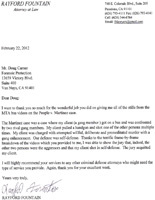 I want to thank you so much for the wonderful job you did on giving me all of the stills from the MTA bus videos on the People v. Martinez case. The Martinez case was a case where my client (a gang member) got on a bus and was confronted by two rival gang members. My client pulled a handgun and shot one of the other persons multiple times. My client was charged with attempted willful, deliberate and premeditated murder with a gang enhancement. Our defense was sefl-defense. Thanks to the terrific frame-by-frame breakdown of the videos which you provided to me, I was able to show the jury that, indeed, the other two persons were the aggressors and that my client shot in self-defense. The jury acquitted my client. I will highly recommend your services to any other criminal defense attorneys who might need the type of service you provide. Again, thank you for your excellent work.